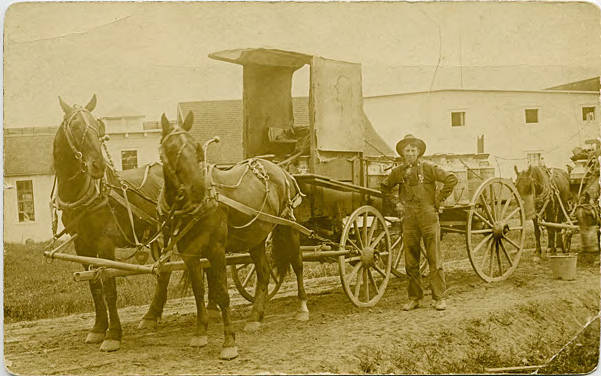 Sepia-toned image of a young man standing beside a wagon drawn by a two-horse team. The front is a covered seat, and the back is flat and filled with milk cans. Another wagon also loaded with milk cans stands behind the first. The road is dirt, and in the background is a large industrial building. 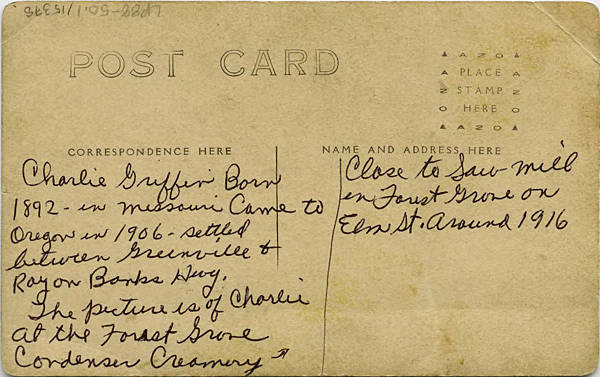 [back] [pen] Charlie Griffin born 1892 in Missouri Came to Oregon in 1906 - settled between Greenville & Roy on Banks Hwy. The picture is of Charlie at the Forest Grove Condenser Creamery. Close to Saw mill in Forest Grove on Elm St. Around 1916.